So waaay back on the 5th September, I headed to Landan town to stay with a friend for the duration of my week's work experience with Mizz magazine- in Tunbridge Wells. Quite a set-up having to get down to London, to travel to Tunbridge Wells but at least that way I could stay somewhere for free, even if it did cost me £12 a day to commute- cheaper than Travelodge for sure! London is a shopping paradise, that's a given, but a (severe) lack of funds and time meant that I didn't really have an opportunity to make some great purchases. So, because it's pretty disappointing, I'll get my London observations out of the way now. I was staying in central Covent Garden (rather swish, I know) and unfortunately only had time to quickly pop into the two vintage shops near where I was staying. The nearest was Blackout II, which was literally a few doors away. Blackout II is the embodiment of the expression, 'quality over quantity'. A small shop, although according to the website it has an upstairs (missed that one), it's like an Aladdin's cave filled to the brim with vintage bits and pieces. I found the selection of bags and hats most impressive. They were mostly high quality accessories from the 20s to 50s- a far cry from some of the stuff you usually find in COW. 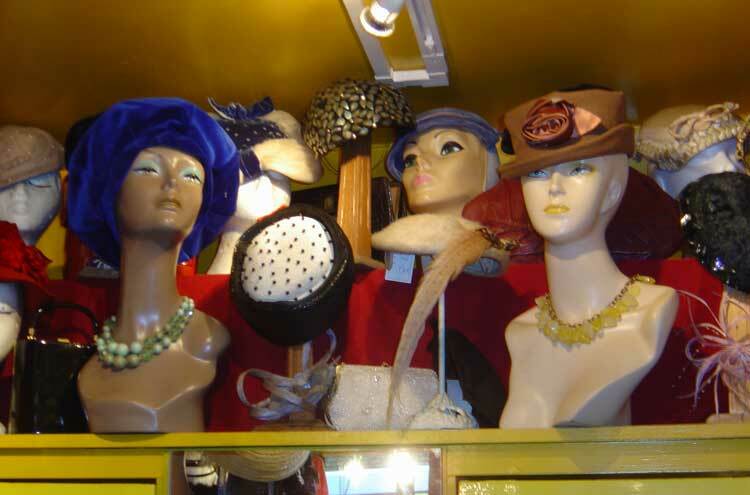 These were kept on mismatched vintage mannequin heads on a shelf which ran around the whole shop. The effect really was fantastic. The jewellery was impressive too. 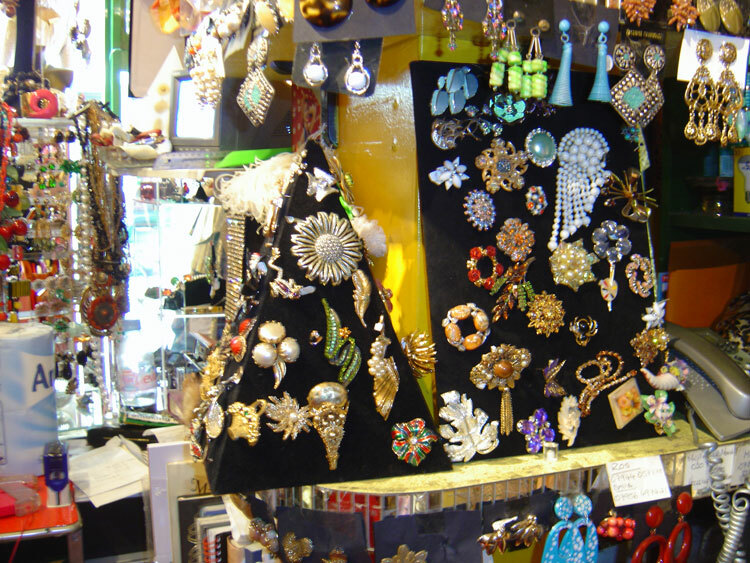 There was tons of costume jewellery covering the surface by the till- if brooches and clip on earrings are your thing, this is the place to go! Blackout II's selection of clothes were something to behold too. You could describe the shop as 'proper' vintage- everything is of high quality as is generally older than the stock of most bigger vintage shops. Women's clothing was mainly pretty daydresses from the 40s and 50s and were priced around the £40 mark- well worth paying for the quality. They also had quite a good stock of evening dresses which could be hired out too. If you're fed up of warehouse-style vintage stores choc-a-block with gear reminiscent of C&A in the 80s; It's well worth squeezing yourself around Blackout II's tightly packed space. I also spotted Covent Garden's Rokit store on the walk back to my accomm (didn't realise that there are 4 at the time!). Rokit have a pretty strong online follwing as they sell through their website too, so I was already aware of the brand and was dying to take a look. The first day I made it back from Tunbridge Wells early enough to catch them before closing I was straight in there. In a funny sort of way, it was more depressing browsing the rails in Rokit than it was at Blackout II, even though Rokit was the cheaper vintage shop. I guess because I know it's the sort of place I could usually afford to shop at, but as I have zero monies, I couldn't indulge my habit. Rokit is very reasonably priced- well, most items are. I thought the denim jackets were quite expensive at around £45 (my vintage Levi jackets both cost under a tenner); however most of the clothes were pretty cheap. I thought the shoes in particular were very good value- they were mostly under £15 in the sale and there were loads to choose from. 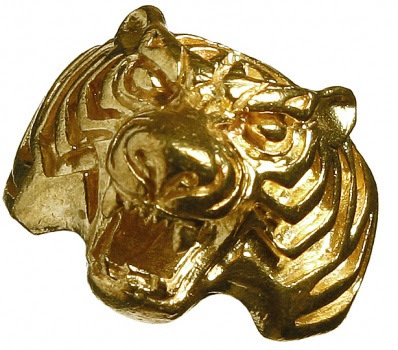 I decided that if I'd had a spare tenner, I would've bought one of the awesome gold animal rings displayed in a big cabinet. I'm sure they were £10 in the shop, but the website tells me otherwise at £15. I think this tiger one is my fave. I might order one soon, but I reckon there's loads of these knocking about as they're most likely cheap vintage deadstock costume jewellery.